The executive order, which Trump is scheduled to issue Tuesday afternoon, was supposed be an easy bit of outreach on the final day of Black History Month to the black community that soundly rejected Trump on Election Day. It is expected to move a federal initiative focused on the colleges from the Education Department to the White House and set an aspirational goal for government spending at the schools. But the goodwill was quickly overshadowed by DeVos’ statement, which came on the heels of a Monday meeting between Trump and presidents of the schools that left some dissatisfied. Some experts on historically black institutions panned the statement as ignorant, while others said she was inadvertently praising segregation. 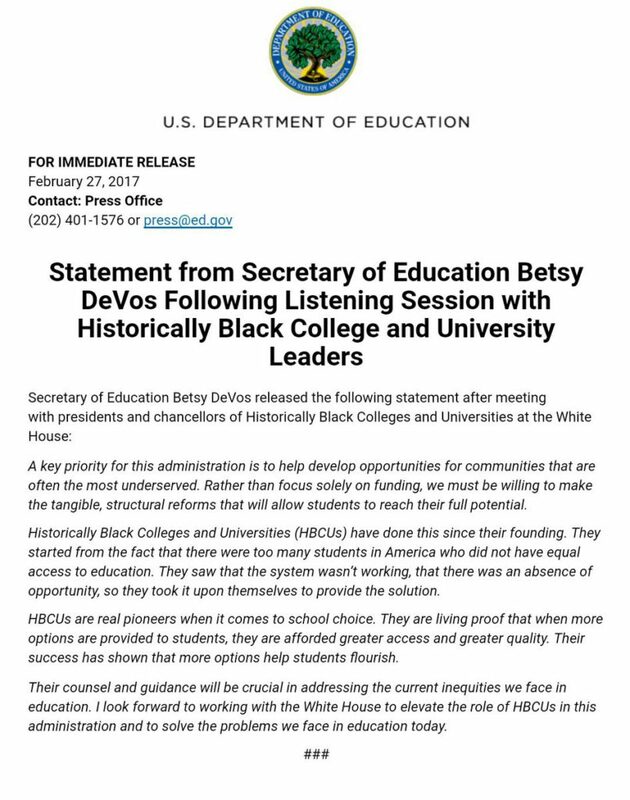 Maybe such segregated schools would be the choice of segments of Trump voters (the more despicable ones), but black students certainly have never seen this as giving them more options. I tweeted this before reading the statement by DeVos, but it still holds: Just in case something horrible happens, please don’t let Betsy DeVos be the designated survivor during Trump’s speech to Congress.